We've been with Jamie Kelly through her search for inner beauty, poofy bridesmaid dresses, and desperate attempts to make money during summer vacation. Along the way, she's left us with countless gems of wisdom, such as: "If somebody ever asks you to kick her in the face, the first thing she will do is forget that she asked you to do it," and "As long as you keep laughing at how dumb something is, you can secretly enjoy it without risking your cool." Now Jamie's upcoming diaries have a fresh look and a fun twist. 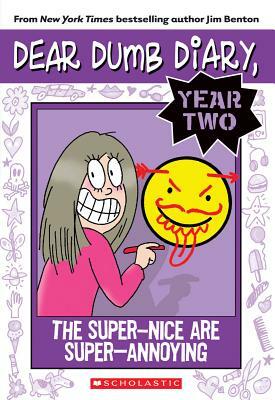 It's Dear Dumb Diary: Year Two! The diary entries are still laugh-out-loud funny -- but this is a whole new beginning. Everything is another year dumber!